For many, a significant part of the social media experience is scrolling through a news feed to see what other people are posting. Whether it’s to see the latest news or pictures from friends, many people no doubt spend much of their time scrolling through Facebook, Twitter and other social media platforms. However, Google aims to make content searching even more personalized and user-friendly with its new Feed. Notably, the company is doing away with its former predictive search feature, Google Now, and instead blowing up that technology and those ideas into its new Feed service. “Each individual is made up of a unique set of things to keep up with,” said Emily Moxley, director of product management at Google Search, in a phone interview. “Using this insight, as well as our technological imprint and machine learning, we can provide content that is interesting to you in this one singular place.” With Feed, the idea is to have Google know what interests you, which will help it search for and prepare related quick-hit content accordingly. According to Moxley, there are four key features on Feed to help its users get the best experience possible. Feed is populated with content related to a user’s interests, determined both by interactions made with Google and explicit commands to follow a particular topic.These are displayed on cards and feature stories or other information. For example, Moxley said a person with interests like Beyoncé, Game of Thrones and the Golden State Warriors, would have cards filled with related stories curated to them accordingly. Specifically, she mentioned that Feed could help a person following upcoming entertainment releases can stay up to date on new, relevant information. A user following, say, Avengers: Infinity War, Marvel Studio’s 2018 massive blockbuster team-up, would have content come up about the movie as it becomes available. When the movie’s first trailer officially releases to the public, Feed will share the footage with the user. A link may also pop up afterwards to the Cineplex website (or other appropriate movie theatre chains) to purchase a ticket for the movie when it becomes available. When searches are performed in the app, the resulting hits will now show a ‘follow’ button that can be tapped. The Feed can also be customized by tapping the three dots on top of each card, which can be shared to other social networks from there. This synergy between topics that are searched for and the content that is provided accordingly is something Google says it wants to focus on. Google intends for Search results to be helpful even when a given subject is already followed in the Feed. For example, from a Canadian perspective, Moxley referred to the Air Canada Centre and how it was recently announced to undergo a name change to the ‘Scotiabank Arena.’ Anyone following the Air Canada Centre with Feed would have been notified of the update, while those who simply searched for the ACC would also have seen the news. What Feed aims to do take this searching much further. Tapping on the header of this card would bring up further relevant search results, such as upcoming sporting events at the Arena or directions on how to get there. Moxley says the idea is to offer as many resources for users to have the option of “diving deeper” into related content, if they so choose. Google says its algorithms are set to pull stories from as many sources as possible, with an emphasis on those that are fact-checked when possible. “News stories bring up many points from different stories,” Moxley says. “We’re showing [all of] these stories in the broader context to see what others are writing about. The Feed is a place to access diverse opinions, cultures and viewpoints.” The goal with these trays is to bring up multiple perspectives so readers can learn as much about a given story as possible. 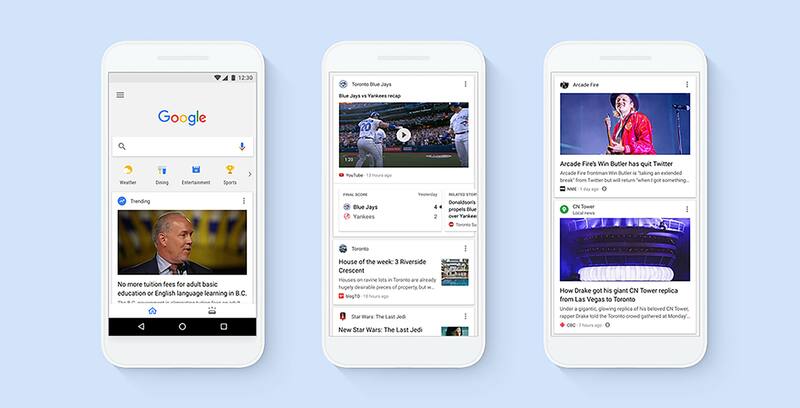 At the same time, users can tell Google they’re “done with a story” to no longer see future updates, as well as stop seeing content from a specific publisher. However, individual publishers can’t be followed as of yet, only certain subjects. For example, Moxley cites how she used Feed during a recent trip to Croatia. Before travelling, she searched ‘Croatia’ in Feed and content published about attractions in the country became available, such as rock climbing activities. While these stories may not have gone live that same week, she says they were still nonetheless relevant to her interests and informative to a tourist such as herself. Google says that ‘New to You’ (or whatever it ends up being called) will not be available today at launch, although the company confirmed it will roll out sometime later this year. Feed will be available later today in Canada in Google’s iOS and Android app.